Spring is here. It’s the perfect time to build a deck and create the perfect place for your family to relax and entertain in the great outdoors. When building a deck, there are a variety of decision to make, from the size and shape of your deck to what built-in features to incorporate. But the most important decision you will make is what material you opt to use. 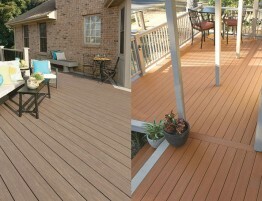 The material you select for your deck will not only impact the appearance and durability of your deck, but it will also affect the maintenance your deck requires. TimberTech’s Earthwood Evolutions Legacy collection should be at the top of your list. 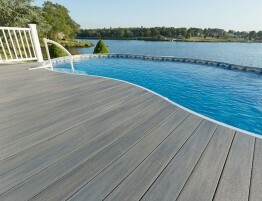 The Earthwood Evolutions Legacy collection from TimberTech is a capped composite decking material. It is comprised of a proprietary composite core encapsulated in a protective polymer shell that makes the plank resistant to the elements as well as years of wear and tear. Capped composite decking, like the Earthwood Evolutions Legacy collection, offers enhanced resistance to stains, scratches, and fading beyond that of traditional non-capped composite decking. It is also resistant to insects, mildew, and mold. 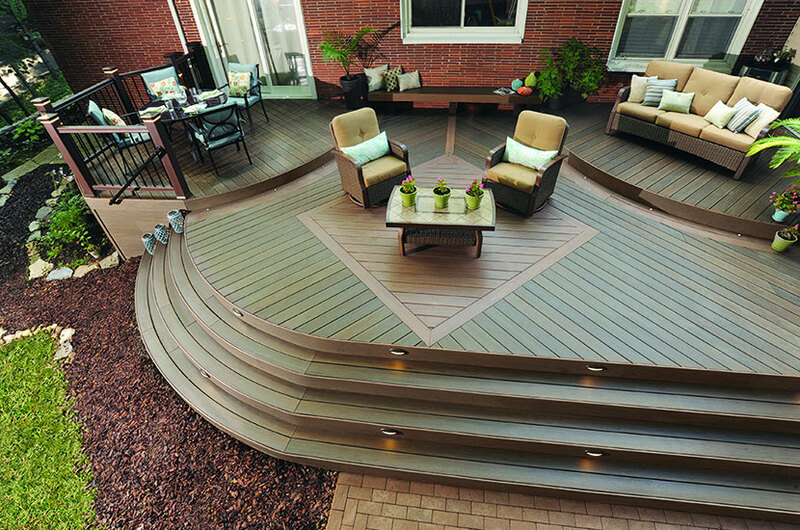 Unlike many other brands of capped composite decking, TimberTech’s is encapsulated on all four sides, including the grooves. In addition to its exceptional performance and durability, the Earthwood Evolutions Legacy collection from TimberTech also offers the outstanding beauty of hand-crafted hardwood flooring. The surface of this decking closely mirrors the look of real hand-scraped wood but won’t trap dirt or dust. It is available in four warm and inviting colors: Mocha, Pecan, Tigerwood, and Ashwood. Coordinated fascia and riser boards are also available. The Earthwood Evolutions Legacy collection is available in a grooved profile that can be installed with CONCEALoc hidden fasteners with no visible screws and in a square shouldered profile that can be installed with TOPLoc using color-matched screws. The Earthwood Evolutions Legacy collection from TimberTech is virtually maintenance-free. You’ll never have to sand, stain, or seal it. Simply give it an occasional cleaning to keep it looking great. It also offers a 25-year fade and stain warranty. 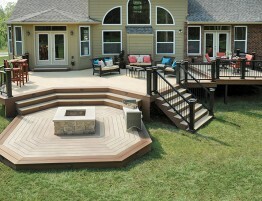 When building a deck, choosing the right materials can make or break your completed deck….